On 20 June, the summer solstice, the Postal Service will release a first-of-its-kind stamp that changes when you touch it. The Total Solar Eclipse Forever stamp, which commemorates the 21 August eclipse across America, transforms into an image of the Moon from the heat of a finger. Tens of millions of people in the United States hope to view this rare event, which has not been seen on the US mainland since 1979. The Moon's umbral shadow will travel a narrow path across the entire country for the first time since 1918. 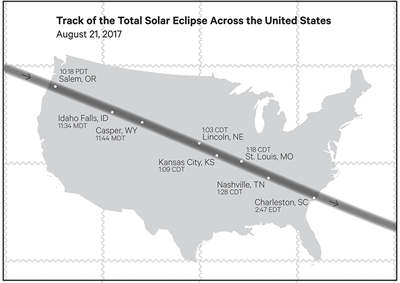 The path of totality will run west to east from Oregon to South Carolina and will include portions of 14 states. The stamp image is a photograph taken by astrophysicist Fred Espenak ("Mr. Eclipse") of Portal, Arizona, that shows a total solar eclipse seen from Jalu, Libya, on 29 March 2006. In the first US stamp application of thermochromic ink, the Total Solar Eclipse stamps will reveal a second image. Rubbing the eclipse image with your warm thumb or fingers will reveal an underlying image of the full Moon (also shot by Espenak). The image reverts back to the eclipse once it cools. The back of the stamp pane provides a map of the 21 August eclipse path and times of totality for several cities. Art director Antonio Alcalá of Alexandria, Virginia, designed the stamp.